80,000 women in the United States alone are diagnosed with uterine, ovarian and/or cervical cancer each year. Out of those women, 50,000 are diagnosed with uterine cancer and 22,000 are diagnosed with ovarian cancer. An even scarier statistic: about 11,000 women diagnosed with ovarian cancer each year will die because of a late diagnosis, and that doesn’t include those who are diagnosed with uterine or cervical cancer. September is Gynecological Cancer Awareness Month. Cancer is a scary thing for anyone. It’s like an unwanted predator lurking about in the dark night, waiting for its chance to pounce and feast. It is a thought that almost everyone has at some point – What if I get cancer? I grew up in a family where all different types of cancer are common – breast, uterine, thyroid, skin, lung and the list goes on and on. It’s a scary thought, but I am convinced that at some point I will get some form not only because of my genes but because of my past bad habits. I failed for a long time to take care of myself. I used to go tanning five days a week, I ate terribly and I socially smoked. I might as well have been asking for cancer. Yes, there are other aspects to getting cancer, but I was making myself more susceptible to the disease. 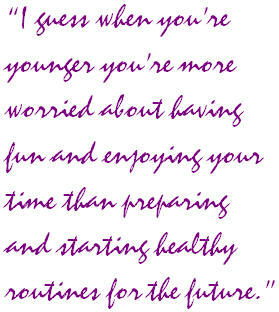 I guess when you’re younger you’re more worried about having fun and enjoying your time than preparing and starting healthy routines for the future. As I got older I realized that you only live once, so why would I shorten that time just because I liked the way my skin glowed when I was tan? In March I finally finished up my three shots of human papilloma virus (HPV) vaccination with my primary physician. It took me 23 years to get that vaccination because I was too afraid of needles. I finally said to myself, you know what’s scarier? Getting your cervix shaved down because I contracted HPV, or as I call it “pre-cancer”. I stopped socially smoking because I realized I did it as just something to do. There was no dependency, no benefit, no gain. And I struggle every day to make the healthier food choice. Obviously I would love to eat unhealthy food all day but I try to eat a salad at lunch or a light and healthy breakfast. Uterine cancer is linked to excess body fat because of the increased levels of insulin, estrogen and inflammation in the body. At 26-years-old, my mother had to have a full hysterectomy because they found pre-cancerous cysts in her ovaries, fallopian tubes and uterus. I’m 24 and I worry at least a couple times a week that if I don’t use it, I’ll lose it…to cancer. Though September is coming to an end, everyone should schedule an OB-GYN appointment to get their assets checked out. Cancer does not discriminate and can come out of nowhere. I go every six months to make sure everything is running properly, and every woman should do the same. Cancer is not a joke, nor should anyone take the idea of getting cancer lightly. It is “till death do us part” partner you never asked for. Those who survive cancer still live the rest of their lives with the memories of this disease and how it affected everyone they know and love. Be safe and take responsibility for YOUR life, YOUR body and YOUR FUTURE. A few years back after receiving radiation on my hips and pelvis my doctor had given me a lot of precautions. No heavy exercise, no using the treadmill, no high-impact exercises, very minor elliptical and most definitely yoga and water aerobics. This was a bit hard for me to take due to the fact that up until I was re-diagnosed, I was playing soccer on an intramural team. In fact, the day of the re-diagnosis, before I had learned the cancer had metasized to the bones, I went to the gym and started a membership. To me, it felt like a tug of war with cancer; it was holding all the cards and had control. Besides, I am the type of person who just needs to keep actively moving. If I’m not sweating (besides my hot flashes) I don’t feel like I’m doing anything. When I got the “yellow” light (to this day my doctors have never really given me a “green” light, but have decided to share their heads and recommend I take it easy and be safe when I tell them of my adventures). I decided I needed to find something that could help strengthen my upper body. I am always on guard for lymphodema. So, I thought about pilates and learned about the Reformer machine which I like but is very expensive. I also tried a few different types of yoga (which was okay) but I still needed something more. I found an ad about pole dancing for exercise. In my head it was very logical. I could only imagine that it was a job requirement to have a strong upper body to do things people do on the pole. I decided to sign up for six classes figuring the only way to commit to the workout is to commit my wallet. Keep in mind, I signed up for the absolute beginners classes which I figured would be a breeze. Back in my hay day, I was pretty good on the monkey bars and I still sear if my mom had let me continue my acrobatic classes after third grade I could have been an Olympic gymnast. I go to my first class. I didn’t realize there was a wardrobe requirement. My shirt, sneakers and sweatpants weren’t quite cutting it. Next problem was the class for absolute beginners was filled with intermediates since the other class was held too late in the evening for most people to attend. I was the only true absolute beginner. Everyone around me was flipping around, swirling and not to mention wearing heels that by just trying them on would have broken my ankle. My initial instinct was to run but I figured I had some athletic skill and I could figure it out. I took my spot in the front of the classroom and the class began. Needless to say, it was one of the worst 45-minute sessions I ever lived, which is saying a lot because I have gone through some aggressive chemotherapy. The teacher wasn’t ready for my level of beginner. I spun around once and hit my left side, which was still inflamed (I originally had a translap but had to switch to implants due to wanting the breast even after the second mastectomy). I did a bit of damage to myself, which didn’t hurt, but it’s hard to say when you’re bleeding from your chest “it’s okay. I’m just in the middle of getting my breast reconstructed because of a mastectomy,” and consider myself logical. When the class finally ended, I ran as fast as I could. I realized I had eaten a seriously big piece of humble pie and had the urge to shake hands and feel the arm muscles of anyone who was in the profession of dancing on a pole. Most importantly, realizing I need to do a lot more research and potentially take a sample class to figure out what would work best for me. Why Does Being Selfish Always Sound Negative? I am fully aware that being an overall selfish person isn’t something anyone should strive for. I am also aware that we sometimes judge ourselves as “selfish” when we are simply attempting to survive life’s tougher challenges. I’ve fought many battles in my life. First was depression and low self-esteem when I was in high school and now throw in a splash of stage four cancer as an adult and the good times are really rolling! By no means am I making light of the seriousness of any of these situations. Any one of these issues brings an end to life, as the individual knows it and a lifetime of challenges. It has been said on many occasions that “fighting cancer is 95-percent mental and the rest physical.” I truly believe this and that means to get through the day you need to be a little selfish! I don’t mean pushing someone out of the way to get a seat on the bus. I don’t mean going to the mall and erupting into a ghetto tug of war because you grabbed a shirt out of the hands of someone who was looking at it before you! I mean turning your phone off when every person on the other end demands a piece of you and there aren’t any pieces left. I mean getting a hotel room for a night when you’re feeling overwhelmed and need some alone time. I mean going to a restaurant and savoring best tasting and highest calorie items on the menu. I mean buying those cute $20 clearance shoes because they made you feel good – no matter how much you still owe on your student loans. Whatever the “I mean” is for you, do it when you need it! If brings you back from the brink of mental slump, DO IT! Treasure yourself! God does, so why don’t you? For example, when I was diagnosed with cancer I decided I needed to teach everyone how to treat me. And even become my caregiver. I’m not big on support groups as a choice for myself. But there are numerous moments where I need to vent steam, laugh or cry. Since I normally can’t just predict those moments, I’ve learned to have people prepped and ready when I need the services of a caregiver. 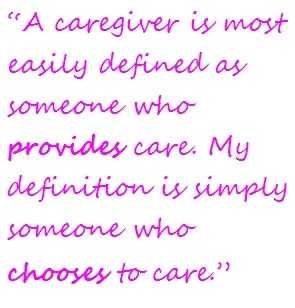 My definition of a caregiver is simply someone who chooses to care. At my last job, I had a very rough time. There were times I could feel myself exploding inside. I was literally a ticking time bomb. On one of these many occasions, I just pinged a coworker on instant messenger and said “let’s go”. Without knowing where we were going or why, they got up and left with me and we walked for a while and I ended up stopping for ice cream, which we all know has healing powers. It helped me focus on something different for the moment. With the coworker, we didn’t have any profound conversation, nor did I cry. I’m not even sure if I really said anything until I got the ice cream. But at that moment, they were my caregiver. I’m not sure if they realized how close to blowing my top off I was (maybe they could see the smoke coming from my ears) but it was just insanely good timing that worked it out. They cared to stop what they were doing to take a walk. It impacted me in a big and positive way. Now, don’t get me wrong, do I sometimes wish I had a dedicated support person in the form of a husband? Of course I do. But the reality is one person is not enough of a system. They may not be around. They get burned out. They are not just dealing with watching someone they care about showing a different, vulnerable side but they are also trying to still live their own life. It used to frustrate me because people I thought would be there weren’t and others who I didn’t think cared on that level were. I started realizing, who am I to be so picky? Someone being sincerely interested in me and what is going in my life is being my caregiver. Unless you are married, its quite hard to explain to employers that you are trying to take care of a non relative. No matter how close you may be. What does this mean? You may need to seek out other people and ways to get care. Appreciate the people who are there and realize there is no instruction manual. They may be annoying to you and it might be time to take a little break and utilize someone else. Sometimes when someone says a kind word to me randomly, they are being more of a support system than they will ever know. Here’s my point. You can recruit caregivers without them even knowing it. Regardless of what we are going through with our sickness, we all have different ways of needing help. Its okay to reach out to anyone who is around you. Sometimes people want to help but don’t know how and there are people who don’t want to help because they either figure they aren’t good at it or they have never even thought about it. I genuinely believe in “caregiver burn out”. I figure the more I have, the less likely my core ones will run low on fuel and burn out. To Stuff or Not to Stuff – That is the Question! Most don’t realize that I have had a double masectomy (the removal of breast tissue). There are a few different paths people can take: (1) Implants, (2) Transflap (tummy tuck), (3) Prosthetic for the bra and (4) Saying: “I don’t need anything” and going without having replacements. The first time I was diagnosed, time was not on my side due to the fact that it took about six months to diagnose me. The most obvious choice for me was to have a transflap masectomy because I was afraid of waking up from surgery seeing myself without anything on my chest. Side Note – I am a medical chicken. I consider true horror and gore watching the Miracle of Birth and pretty much any medical pictures. What I didn’t know at the time is that you can only have that surgery done once due to the extensive nature of it. I’m pretty sure a woman thought of the idea, while a man figured out how to do it, which is why it’s so intense. But for most people that is where there story ends. Unfortunately, that is where mine begins. When the cancer came back about two years later, I ended up needing to go the implant route for the other side. But since things do not seem to go on the smooth path for me (the radiation I underwent years earlier broke down my skin cells so much that they couldn’t handle the implant. It literally broke my skin when trying to expand it. And believe me I have never had images of myself as a d-cup. Only a full-c). Needless to say, right now I am currently in a weird place. I have a temp-implant on my right side and on my left a breast I am continually trying to heal a hole from radiation and an implant. Only the original fat from my stomach acts as a breast, so it does have the appearance of an a-cup. It’s a weird thing because in one sense its nice to know something is there, but it also triggers sadness because I struggle to figure out should I stuff my bra (when I actually wear one) or just accept it. 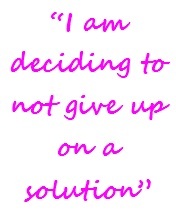 I change my mind every other day but currently I am deciding to not give up on a solution. Right now, the solution a few doctors have given me would be to have a back skin graft done to help with good skin cells on my left side. But I don’t accept that. Before any further surgery is done I will make sure I know every option that is out there. For now, I have learned to not stuff but rather try to find clothes that won’t make me need to make that choice. I didn’t stuff in elementary school and I’m not starting now. Have you ever heard that song by Destiny’s Child? The one what goes “can’t pay my bills, can’t pay my telephone bills, can’t pay my automo-bills!” (well, that’s my version of the song). I am very familiar with that singular line. I admit to not being the best at budgeting but cancer has definitely made keeping up with day-to-day finances even more challenging. It’s the idea that you have to budget for something you didn’t ask for nor do you want. At least with student loans you’re paying for something you wanted to do and got a lot out of (okay, some so out of it). Even with great insurance, there are still many out of pocket expenses that come with trying to become more health minded (supplements, organic foods, going to a nutritionist or because you have maxed out your insurance for the year). Now throw in being single, in a single-income home and YIKES we’re talking instant blood pressure spike. THEN sprinkle on top of that gas, carfare for traveling to treatment, a dash of day-to-day bills – heat, electricity, water, etc. Like is expensive and it’s even more expensive paying for a life with cancer. What you’re about to read is very controversial. It may make you feel uncomfortable but it’s time to throw it out there. 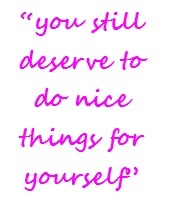 You deserve to do nice things for yourself. My brother used to tell me “no one will treat you better than you”. I’m still trying to learn and understand how to apply that to all aspects of my life (in a reasonable way) but it does strike a chord especially dealing with this enforced craziness. Treating yourself may mean splurging on your favorite candy treat, enjoying a nice meal, a weekend getaway, buying a book or making time to read it. For me, it’s going dancing, spending time with friends, purchasing that dress that I can never find an occasion for but really want, creating a new playlist for my iPod, shutting the world off and watching a good Better Davis movie. My list goes on and varies. There are ways to be good to yourself without breaking the bank, buy maybe it means calling a creditor and negotiating a smaller breakdown of payments. This will allow you a chance for a little treasure. This can make the difference of that fine line of sanity and a full mental breakdown. How long can you possibly last if you never address the fact of needing to be your own cheerleader even when you have a network of people cheering you on? So fund what will give you a moments pleasure and sit back, close your eyes and enjoy that guilty pleasure. Can Your Mojo Really Get Dusty? Now, I’m not sure how other single people feel who have cancer but even the moments I feel lonely and would love at least a cuddle buddy, I am not that motivated to actively do something about it. The movie 50/50 actually did a fantastic job of showing the awkwardness in trying to date but also show some of the issues that may come with an attempt at intimacy. For me its a bit of a catch 22 happening. I feel like its important to not allow cancer to change you but there is also a consideration which would be great if the person you were attempting to deal just naturally had. In the end, it is a personal decision to know when or if your ready. One of my biggest pet peeves is when I am told I need to be open or make myself available to someone. With all that spare time, I should be able meet my future mate, and at least had three to four dates. Unless it is a relationship solely based on skype or texting time then I guess that most likely won’t work. However, that doesn’t mean I can’t do some experimentation. My personal challenge is to make sure I wear a billboard and flashing lights to declare my availability.